Professor Havers’ rejoinder to my critical remarks about Strauss and his disciples is truly a model of reasonable discourse. If I do bother to respond, it is only to correct or explain those apparent inconsistencies attributed to me. Allow me to note the contrast between Havers’ style and a certain posture that Claes Ryn, Tom DiLorenzo, and I have criticized in our broadsides against the Straussians. Unlike our typical targets, Havers shows no sign of “thuggish” behavior. Certainly I could not imagine him following the example set by his fellow-Straussians, who once called up a university at which I was being considered for a high appointment and proceeded to accuse me of insufficient zeal for the Zionist Right. To cut to the chase: Havers suggests that because Michael Novak faults Straussians for not talking about (a generic) “Judeo-Christian” tradition as a factor in the American regime, one should not leap to the unwarranted conclusion that all Straussians are neocons. The problem with this admonition is that the overlap between the two persuasions is great enough so that the exceptions really don’t matter. 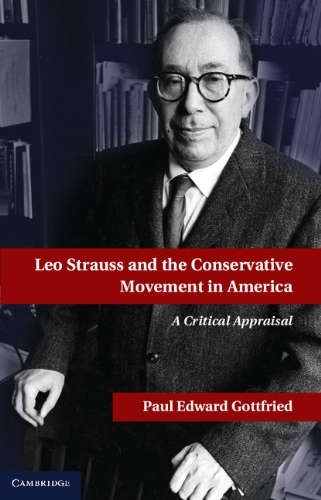 Should we not generalize about a Straussian-neocon connection in view of such exemplary figures as Allan Bloom, the Kristol family, Paul Wolfowitz, Harvey Mansfield, Richard Perle, John Podhoretz, Thomas Pangle, David Frum, Clifford Orwin, etc., etc.? The one qualification that might be in order is that while Straussians are usually neocon intellectuals, not all neocons are Straussians. From my impressions, most neocon journalists are insufficiently well-educated to have mastered the Straussian lingo or to have read even the secondary literature that the group has in common. While all neocons, to illustrate my point, know that they must dislike Germans and Southerners as part of their collective identity, only the Straussians will dress up these prejudices with windy lectures about Teutonic historicism or the dangers of Confederate value-relativism. A more interesting question than the one about Straussian diversity or the lack thereof is whether Strauss pushed his disciples in the ideological direction in which they went. Without exaggerating the continuity, I cannot agree with Havers’ description of Strauss as “simply too complex a thinker to fit neatly into any ideological box.” For one thing, the Straussians who now storm across the political landscape studied either directly with Strauss or with one of his high-placed acolytes. (The notion that the Academy discriminates against the Right can only be successfully defended if one drops from consideration the overabundance of Straussians ensconced in our prestige universities.) The contacts in question are therefore more than fortuitous and suggests the possibility that what the Straussians are now putting into the mainstream media and inserting into President Bush’s cranial spaces may be at least partly derived from a single teacher who is held by the entire group in high regard. This suspicion takes on weight if one compares, as I have done in my books, the master’s political stands to those of his students. Although this may be a matter of interpretive difference, unlike Professor Havers, I have noticed a close connection between the two sets of beliefs. Straussians may have sought a master with whom they knew they already agreed, in order to find scholarly justifications for their pre-rational beliefs. That many of these students came to Strauss or one of his disciples as Jewish agnostics, albeit agnostics with strong Jewish ethnic loyalties, and with devotion to New Deal America, dislike for the Germans as a Nazi-prone people, for Southerners as rednecks, and for religionists as dummies may have made the resulting symbiosis more than likely to occur. The Straussians, that is to say, made the proper choice in the master they picked for themselves. For another thing, Strauss’s writings point very much in the direction that his students took, but not in the same simplistic way as their later work. In Natural Right and History, Strauss expresses seemingly contradictory positions on Locke, both praising him as the true founding father of the American regime but also making sport of his atomistic materialist view of man in society. Strauss, like his groupies, could thereby have it both ways, identifying the US with a global mission to spread a non-traditional, secular way of life tied to materialist values and then sneering at the Straussians’ own global democratic project as coming from a relatively vulgar political philosophy. Whence the oft-noted Straussian expressions of distaste for having to manufacture metaphysics for the masses, a task that Straussians usually eagerly pursue in high places in return for both fame and big bucks. Havers believes that I should like Strauss as a conservative because he attacked a bad thing called “historicism.” But if Havers reads more closely, he will find that Strauss is more concerned about the dangers of historicism represented by Burke and nineteenth-century conservatives than he is with the fruits of Marx and of other revolutionary socialists. Let Havers reread Natural Right and History (Phoenix Edition, 1965), 250, 320—21; and a revealing essay by Strauss’s sympathetic interpreter Paul Norton in Modern Age (Spring 1961). Both indicate strongly that Strauss’s concern about historicism was limited to the rightwing kind, which he saw as going from European counterrevolutionaries of the late eighteenth century down to “the ideas of 1933.” Although Havers may have misread my own thinking, which has been heavily influenced by a modified version of the very historicism that Strauss attacks, even if I were an anti-historicist of the Right I could not imagine why Strauss would appeal to me as an enemy of historicism. Unlike serious critics of the revolutionary and apocalyptic Left, this author never really addressed the questions that concerned those who stand in fear of leftist (and dare I to say?) global democratic missionizing. In fact Strauss’s encouragement of “democratic value”-talk, often cynically pursued, and his studied blindness to the dangerous potential of the Left (and not just Stalinism or Islamo-fascism) has contributed to what my friend Ryn has exhaustively discussed in his books on the “new Jacobinism.” That so many of those who engage in revolutionary hysterics are also self-described Straussians suggests that the apple in this case has not fallen far from the tree.